A pack of 5 needles. Schmetz / Organ. Special design for high speed "Professional Quilting Machine.. VERY LIMITED SUPPLY discontinued by ALL suppliers. 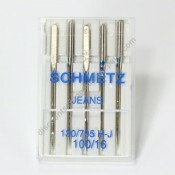 Please note: The 127x1 (flat shank) needle in no.. VERY LIMITED SUPPLY. 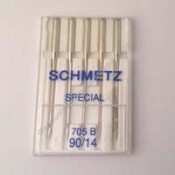 Needle may be supplied in Singer, Schmetz, Organ, Boye depending on availablit..
One needle only. Measures 1 3/4" in length. Fits some models of: Singer treadle, National, Eldredg.. Approximate total length is 32.3mm. 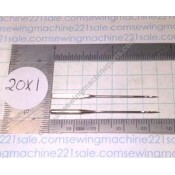 These needles were primarily made for toy and small sewing mach..
7 total needles per card. Includes Needles for: Canvas, Carpet, Leather, Sacks, Sail, and Upholster..
A pack of 5, size 14. This is a great general-purpose needle for all of us. Especially those who fi..
A pack of 5. Extra sharp point for denim (jeans) and similar densely woven material, also for artif..
An assorted 5 pack, 3 size 11 and 2 size 14. Designed with a special scarf and large eye to prevent..
For a pack of 5, size 18 only. For sewing on leather, wedge point. Also suitable for artificial le..
A pack of 5 size 14. The special construction provides trouble-free sewing with metallic thread. A ..
A 5 pack, available in a size 12. Has a sharp point for more uniform straight stitches. For use in ..
An assorted 5 pack, 3 size 11, 2 size 14. 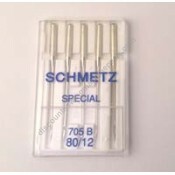 The finest top quality needle for precise quilt piecing. .. Pack of 5 needles. 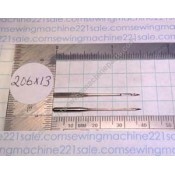 General purpose needle for woven fabrics, medium sharp point. Size 10 extra lig..
Schmetz Special Bernina #705 B (705 BE) Size 12 medium to heavy fabrics (5 Pack). 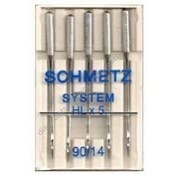 High quality Schm..
Schmetz Special Bernina #705 B (705 BE) Size 14 medium to heavy fabrics (5 Pack). High quality Schm.. Pack of five. 130/705 H.S. (stretch) size 11/75 fine weight. 130/705 H.S. 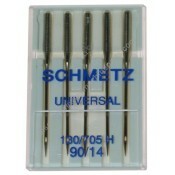 (stretch) size 14/90 med..
A pack of 5. 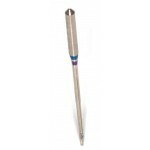 For sewing on knits and synthetic, ball point. Size 11 for light weight fabrics. Siz..
A pack of 5. 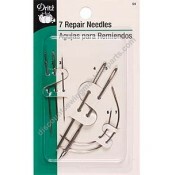 Has an extra large eye and a large groove to accommodate topstitch thread for decorati..
One needle per pack. For stitching three rows at the same time. To multipy the beauty of decorativ..
One needle per pack. 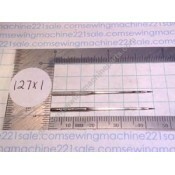 Suitable for 7 and 9 groove pintuck foot.Alternate Part Numbers130/705H ZWI..
One needle per pack. 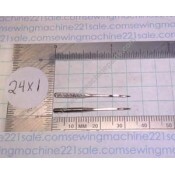 Suitable for 3, 5 and 7 groove pintuck foot.Alternate Part Numbers130/705H ZWI..
One needle per pack. Suitable for pintucking and top stitching light to medium fabrics.Alternate Pa..